I'm Martina Pino. I'm 35 years old. I'm a single mother of my 8 years old daughter. I'm from Philippines. 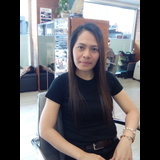 I'm currently working in Taipei City, Taiwan as a live in carer for almost 8 years. I'm taking care of an Elderly woman who is now 88 years old. I am very interested to apply in this position.